After her 200m Indoor National Title, Tamari Davis, does it again setting a new school record for Oak Hall and the fastest time in the nation at UNF on Saturday. 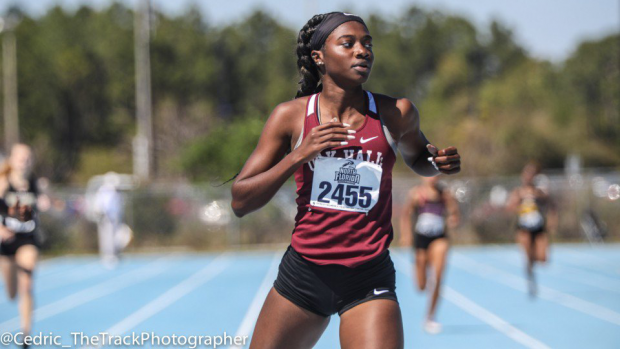 The Oak Hall sophomore ran a time of 23.06 after cruising to two Alachua County Championship wins earlier in the week. Davis now holds two national leading times in both the 100m (11.51) and 200m (23.06). Up next for Davis will be the 100m at Florida Relays this weekend. Niceville junior, Kobe Babin, had a spectacular finish this weekend in the Pole Vault at UNF setting a new personal record of 4.75m (15-07) to win the event. This new vault puts Babin at the top amongst Florida competitors and and tied for fourth on the national level. As we head into the post season in a few weeks, Babin will be your favorite to win the 3A Pole Vault state title with Dominic Boddie and Sam Riley following. Orange Park junior, Alex Collier, won the 100m at UNF in a new PR of 10.68 to edge out Ke'Andre Collins of Sarasota. Collier was fifth at Bob Hayes last weekend in a time of 10.97 and has consistently brought his 100m speed down from the start of the season. Collier followed up his 100m win with a 47.67 in the 400m to blow away the field. Collier ran his PR of 47.33 at Bob Hayes last week. With Orange Park in 3A, Collier remains in the number two spot right behind Tyrese Cooper. Another strong double under his belt, shows that Collier's training is paying off and his consistency is a great indicator of success at the state level come May. Episcopal senior and Clemson signee, Caroline Johnston, continued her undefeated long jump season this weekend with a 5.58m mark and finished second in the triple jump with an 11.49m mark. Johnston has had a very consistent season in the long and triple jump, one of her best yet. Johnston finished fifth in the triple and second in the long jump last season at the state meet. As of this point in the season, Johnston is looking at top two in 2A in both of these events. Consistency is key and Johnson will be an exciting jumper to watch at Florida Relays this weekend. Florida's top two Pole Vaulters, Laine Roberts and Madalyn Kish, went head to head this weekend at UNF. Both ladies completed a mark of 3.65m (11-11.75) for Kish to win and Roberts to finish second. Kish has had an undefeated pole vault season, setting a new PR of 3.71m at the Royal Invitational last weekend. Laine Roberts set a new PR and US Top-15 mark of 3.93m to win at Bolles Relays last weekend. Both ladies will head into the championship season as the top vaulters in their classifications and their consistency this season indicates they will be incredibly tough competitors to beat in the event. Villages junior, Emma Symonds, has had an undefeated high jump season, jumping a new PR of 1.68m at UNF this weekend and setting a Top 5 Florida mark. Symonds was seventh at last year's 2A state finals and as we approach the championship season, Corliss Holland, Emma Symonds, Jena Kish, and Daishon Spann will be very competitive for the 2A high jump state title with all four ladies jumping over 1.65m this season. Troy Smith ran a new huge PR of 4:21.49 to win the 1600m final this weekend at UNF. The Rockledge senior and Florida Southern signee improved his 1600m time YOY by over 7 seconds. This mark puts Smith in a competitive top-5 position amongst 2A athletes heading into the championship season. New Smyrna Beach senior and UNF signee, Aidan O'Gorman, cruised on his future home track to a 9:33.26 3200m win. O'Gorman ran a 9:22 back at Bolles a few weeks ago. Ethan Giger, Jake Turner, Connor Phillips, and Thomas Weiler look to be your top 3A 3200m athletes as we finish out the regular season with all of them sub 9:32.